The Wild Goose, an open-to-the-public venue of the Tahoe Mountain Club, has an award-winning wine list and unbelievably wonderful food. Lou Phillips, an experienced sommelier with a great palate, recently joined wine expert Patrick Hedderman’s team at the Wild Goose. In August, The Wine Spectator magazine recognized Wild Goose with its Award of Excellence, bestowed on restaurants that offer interesting wine selections that are appropriate to its cuisine and appeal to all wine lovers. Over 340 wines to select from at the Wild Goose and 4800 bottles on site, the list is divided between a regular and a reserve wine list. We tasted from the regular list, and primarily those in the wine-by-the-glass section. A true gem is the 2003 Reisling from Dr. PaulyBergweiler Kabinett, which hails from the region of Mosel that could be termed a Golden Triangle. It has a classic aroma with a minerality which some liken to a petrol aroma, and on the back palate a mild white flower taste and honeydew and peach tones. A Kabinett is a high quality German Riesling made from fully ripened grapes, nice and light, semi-sweet with crisp acidity. If you have been drinking German Rieslings for a while, you might recognize this as a Mosel-Saar-Ruwer. Due to a change in wine labeling laws in Germany, it’s now just referred to by the overall Mosel term. Regardless of this quibbling, this wine paired well with Wild Goose’s house-made pretzels served with a mornay sauce, their very good Mac and Cheese, and dayboat scallops. $11 a glass. The 2010 “Lucy” Rose of Pinot Noir from Lucia Vineyards, Santa Lucia Highlands, California, is a wine that is hand-crafted by the Pisoni family which produces small lots of exceptional wines in this cool-climate growing region of California. This rose offers a fresh acidity on the palate, and its light taste matches the light rose color. Wild Goose pairs it with a butter lettuce and strawberry salad, perfect for a soft summer evening. $10 a glass. The Perry Creek “Altitude 2401” is a Sierra Foothills Zinfandel from El Dorado County. It is a plummy fruit-forward zinfandel with ripe, earthy, jammy flavor. Winemaker Stefan Tscheppe produced this reserve wine in an old-world style. Named after Perry Creek’s Fair Play Farms Vineyard's that have an average elevation of 2401 feet, only 1000 cases were made. Tasting notes from the www.perrycreek.com website echo my experience: “Exotic papaya and guava play with lively acidity and rich berry, spice and chocolate flavors. Exotic spices and cherries in the long and smooth finish. “ 14.9% alcohol. $35 the bottle at Wild Goose. The 2009 Broadley Pinot Noir, Willamette Valley, has aroma of raspberry and taste of black cherry with a lot of spice on the palate. It paired well with a scampi linguini containing capers and forest mushrooms, $14 the glass. And finally a Nigl Grüner Veltliner Eiswein 2003 Kremstal, an Austrian ice wine that is absolutely delicious. $15 the glass. For more information on dining and the wide range of activities around Lake Tahoe, see the online version of The Tahoe Weekly. 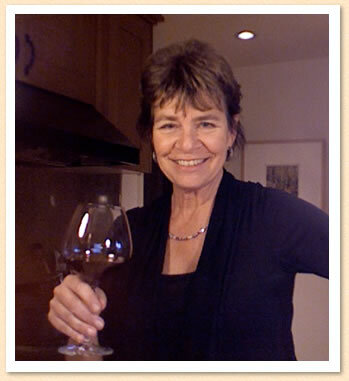 This article appeared in my column "Wine Adventures" in August 2011. ﻿ First stop was the tasting of Szabo wines. The 2008 Syrah is produced from estate grown grapes from their 40-acre vineyard at 2100 feet elevation that sits almost exactly halfway between Grass Valley and Nevada City, with views that include the Pacific Coastal Range and the Sutter and Sierra Buttes. The wine has taste and aroma of raspberry, vanilla and black tea. The tannins to my taste were relatively high, which is not unusual for Syrah. There’s a bit of smokiness or teriyaki on the back palate too. $23/bottle, 14.6 percent alcohol. The Fair Play AVA is unbelievably beautiful right now, and an afternoon at Skinner Vineyards is a perfect way to experience these delights. The new Tasting Room at this new winery in the Fair Play AVA of El Dorado County features a state-of-the-art GreenTech winery, as well. The Skinner heritage in the wine business goes back to 1861 in El Dorado County. The Skinner family has both a passion for winemaking in the Foothills and a dedication to continuing the Skinner winemaking tradition there. The new winery was designed with care to encompass many forward-thinking eco features. Winemaker Chris Pittenger often escorts visitors through the winery and vineyard manager Bryan Rahn has created a first-class vineyard, the Stoney Creek Vineyard, and you may have an opportunity to walk through there, too. Skinner Vineyard’s winery is primarily solar powered; they installed a 55 kW PV system. They also situated the building so the sun side (south) maximizes the solar-power generating potential, and the solar panels line up to give the largest potential area for sun exposure. In the winery, they strategically situated the barrel rooms on the north, more-shady side, of the building for better energy efficiency. Each of the four barrel rooms and the main cellar were built with temperature-controlled sensors, which allows for cooling to be supplied by the cool outside air. All of the fermentation tanks are located within the winery, rather than being isolated outside. This simple design reduces energy costs significantly. The result is the use of much less electricity in order to keep the must and wines at a stable temperature in the tanks. The trellising systems optimize fruit temperatures, and the rows are run up and down the hills to minimize soil disturbance during development, preserving the topsoil and improving erosion control. 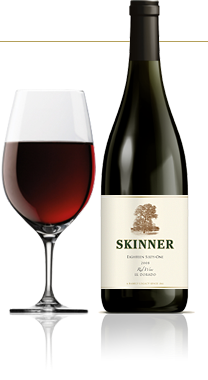 Skinner’s flagship wine is its Eighteen Sixty-One. This is a Rhône-style blend, a red wine made in the style of a Châteauneuf-du-Pap. The vineyard’s warm days and cool nights, coupled with its well-draining granitic soils, provide the ideal growing conditions for Rhône varietals. 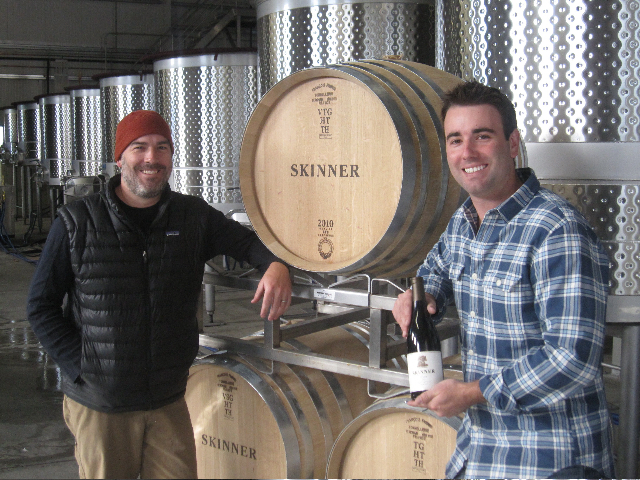 Skinner Vineyards' current collection includes 10 Rhône grape varieties, in addition to several legacy grapes grown by James Skinner himself. The first releases included a 2007 Viognier and 2007 Syrah, both made with fruit sourced from the Skinner family’s Stoney Creek Vineyard, and also a 2008 Grenache and 2008 Grenache-based Rosé from El Dorado. Skinner Vineyards offers another Rhône-style blend – the Seven Generations white wine, a blend of Roussanne, Marsanne and Viognier. Disclosure: I assisted Skinner Vineyards with marketing communications for their grand opening in May 2011. One of the best wine tasting events I’ve been to all year was the one featuring Languedoc AOC wines, where I tasted wines made from grapes that were unfamiliar to me and learned about the fascinating history of this wine region. Below is a look at just a few of the 31 wines that were poured. I was impressed with the aroma, taste and food-friendliness of all that I tasted. Chateau du Donjon’s 2010 Rosé comes from a vineyard situated in Minervois, one of the oldest wine-producing areas in Languedoc. Owned by the same family for 500 years, winemaker Jean Panis produced a ripe, soft and aromatic wine composed of 30% Syrah, 30% Cinsault, 40% Grenache. A lovely pink-salmon color, the aroma is a fruit bowl of strawberries, red cherries and red plums. The flavor is intense and echoes the fruit aroma, and the finish is dry and well balanced. 12.5 percent alcohol. Average internet price (wine-searcher.com) is $14. Domaine la Croix Chaptal, Les Terrasses Rouge, 2007 is produced on an estate that formerly belonged to Gellone Abbey, founded in 804. Winemaker Charles Pacaud’s red wine combines Grenace and Carignan with a touch of Syrah. The taste is of dark fruits that follow the aroma of cherry and perhaps coffee. It is spicy and fresh, and representative of the Terrasses du Larzac area wines. This growing area is in the western part of the rural district of Saint Andre de Sangonis, about 20 miles northwest of Montpellier, a popular tourist destination due to old abbeys and natural caves. Alcohol is low: 13 percent “because we have an especial terroir which expresses the grapes and so we have flavor at lower alcohol,” according to Pacaud. Price around $20 a bottle. Distributed by www.usawinewest.com or call (415) 331-4906 to find out where to buy it; it’s worth the hunt. Chateau des Karantes, Blanc, 2009, AOC Languedoc, is a blend of 54 percent Bourboulenc, 14 percent vermentino, 16 percent Roussane and 16 percent Grenache Blanc. The result is a wine with aroma and taste of honey, lemon, fruit tones of apricot, a long finish and a nice balance between the fruit and acidity. Again, a new grape experience for me: Bourboulenc. Korbrand’s Web site notes that “Bourboulenc is an extremely old grape variety which is thought to have originated in Greece where it was known as the Asprokondoura. A late-ripening variety, it tends toward leanness and neutrality, but when picked at optimum maturity it retains high natural acidity and shows fresh citrus qualities with floral notes.” 13 percent alcohol. $30 by the bottle. Imported by Eagle Eye Imports at www.eagleeyebrands.com or call (248) 396-3589. 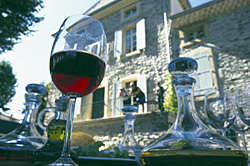 For more information about the Languedoc region, visit www.languedoc-wines.com. A rose might be a rose might be a rose, but a Rosé wine… now those are different from one another! Here are some you might try. Rodney, a recent dinner guest, brought a Rosé from Uncorked in Tahoe City: Juliette’s Dazzle, a 2010 Pinot Grigio Rosé from Colan & Weiss Cellars. Grapes came from Horse Heavens Hills and the Wahluke Slope, Columbia Valley, WA. I wasn’t wild about the wax overcap on this bottle (a real pain to remove!) but the wine was fantastic. Bottle notes:”A special block of Pinot Grigio at the Benches Vineyard was left to hang until it developed a bright tint, then slowly fermented.” A nice dry rose, 13.0 percent alcohol. $20 the bottle at Uncorked. 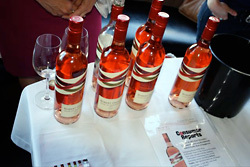 The recent Rosé Avengers and Producers tasting in San Francisco featured a number of Rosés you might want to experience. A nice fizzy Rosé, perfect for an aperitif, is the Elyssia NV Pinot Noir Brut from Freixenet USA. Yep, the same folks who make that nice champagne! This is a blend of 85% Pinot Noir and 15% Trepat. This Spanish Cava is easy going, nicely balanced and medium in body, with a strawberry-raspberry-spice taste and a dry and refreshing finish. The Freiexenet website notes that Trepat is an indigenous grape to the region, with only 1,000 hectares of thie grape grown. “Trepat needs a specific soil and can be found close to the coastal regions of the Penedés due to the unique climates there. It is used only for rosado cavas.” 11.5 percent alcohol. $18 the bottle. Finally, Terre Rouge Vin Gris d’Amador: This is a dry rosé that’s excellent as an aperitif and with a variety of appetizers. You might try this easy recipe for Goat Cheese Spread with sun-dried tomatoes and capers, concocted by Jane O'Riordan, an owner at Domaine de la Terre Rouge, Amador County. Makes about 3 cups. Keeps 4-5 days in refrigerator. In bowl of food processor fitted with a steel blade, puree the garlic and sun-dried tomatoes. Cut the cheeses into small hunks and add to bowl. Pulse/process until all the cheese is blended into a smooth spread with no white lumps. Add the capers and pulse briefly to mix. Scrape into a pretty serving bowl. Cover and refrigerate until ready to serve. Serve surrounded by crackers, toasted baguettes or sliced bread. 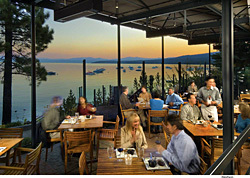 For more information on dining and the wide range of activities around Lake Tahoe, see the online version of The Tahoe Weekly. This article appeared in my column "Wine Adventures" in late July 2011.